Beautiful day out by Salmon Creek in Sonoma County – a bit of sun before the marine layer rolled in thick like a fluffy down comforter over the beaches and dunes. Lots of red and gray fox track and sign, even more striped skunk track and sign. Almost no new rabbit sign. I’m beginning to think that perhaps the area is like an animal beach-condo timeshare – evidently the skunks have it this time of year and the rabbits are vacationing elsewhere. 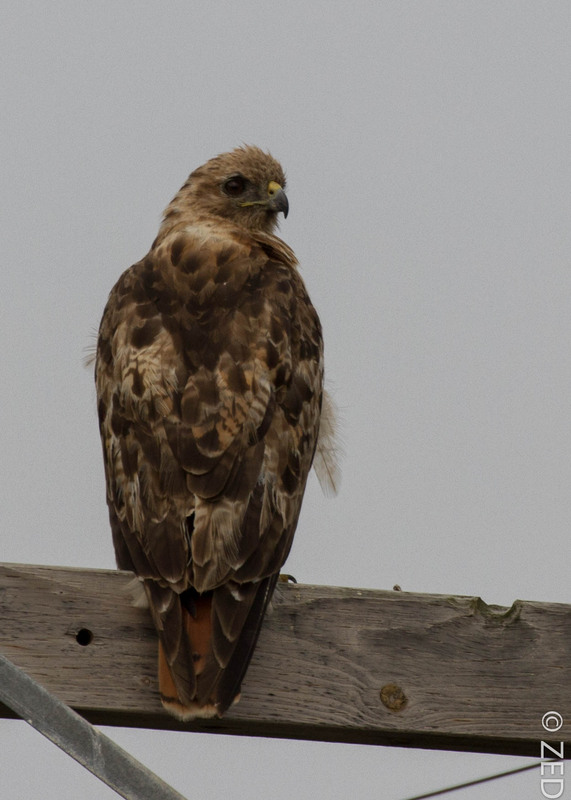 This red-tailed hawk has some really interesting plumage, it reminds me of a bird I saw once in the high desert in Washington. 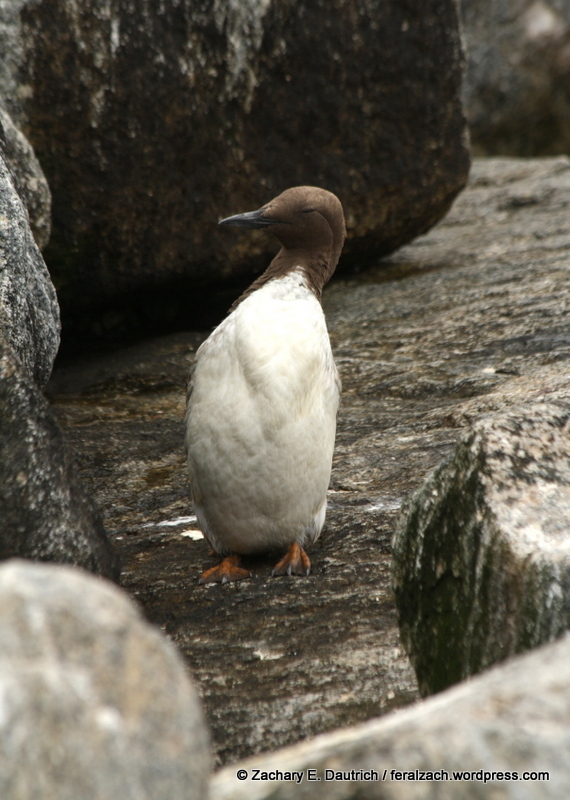 You can see there is tan mixed in with the brown and white on the back, and its head and especially neck feathers are really light. Beautiful bird, very striking. 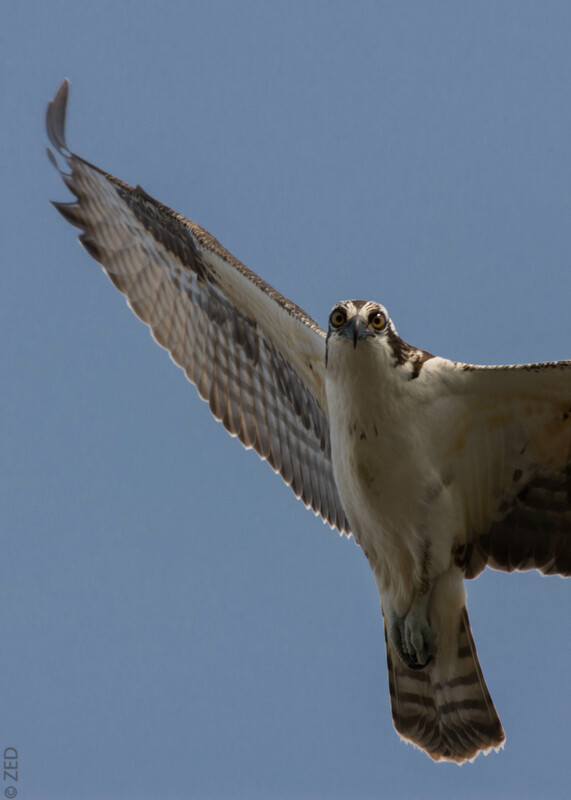 This osprey and I were able to see eye-to-eye today on composing this photo. Much appreciated! Their eyes are HUGE compared to the rest of their head. 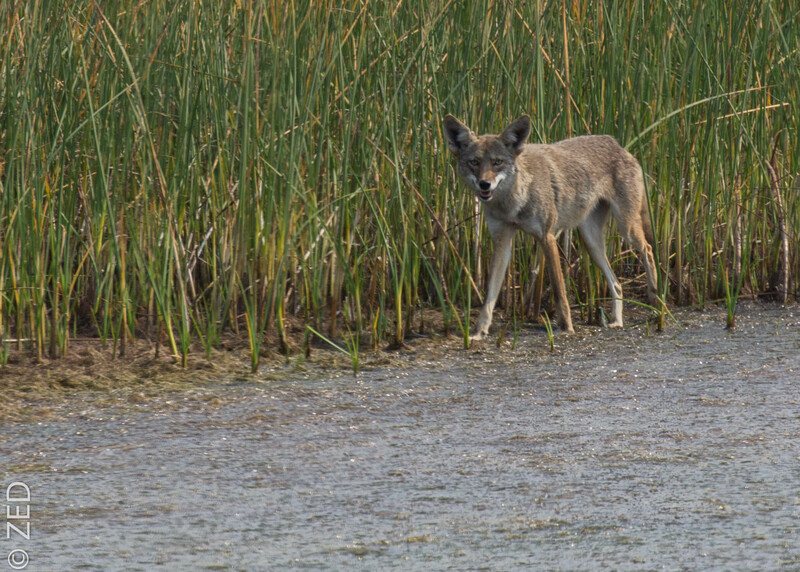 We watched a coyote hunting from across the creek for quite some time, it seemed to be stalking through the high grass, occasionally stopping to dig or pounce. Sometimes it would get really excited and stand with its ears facing the ground, while its tail whirled around like a helicopter blade behind it! 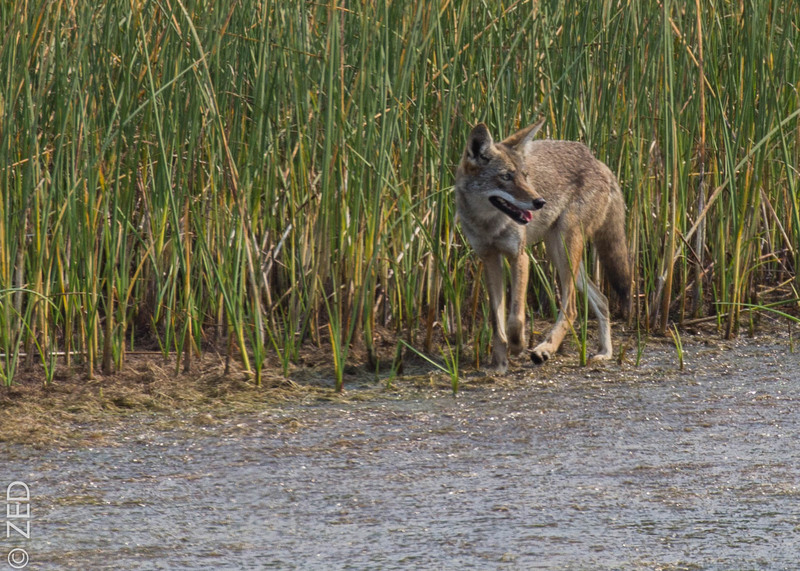 It made a short trip to the waters edge, but all the water fowl were already tuned-in to its presence. 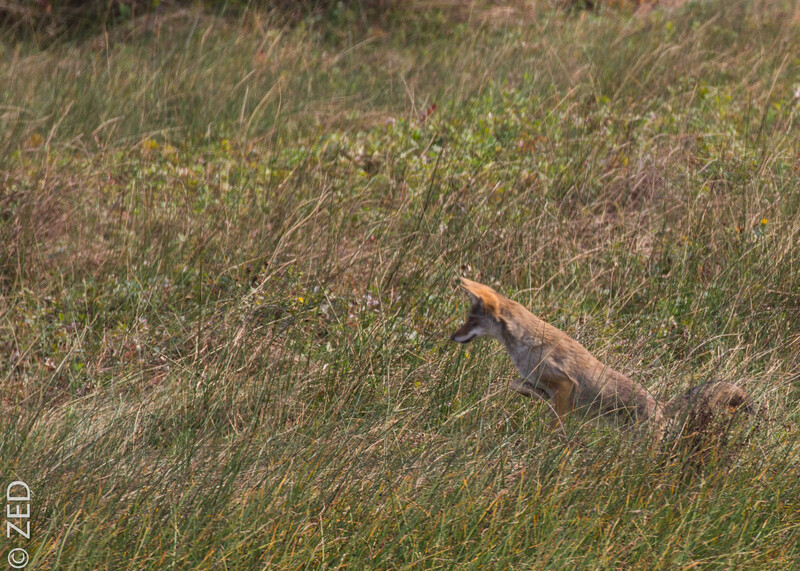 A doe and two fawns watched it with interest from within 50 feet – the coyote didn’t even give them a look. Rodents and insects seemed to be on the menu today. 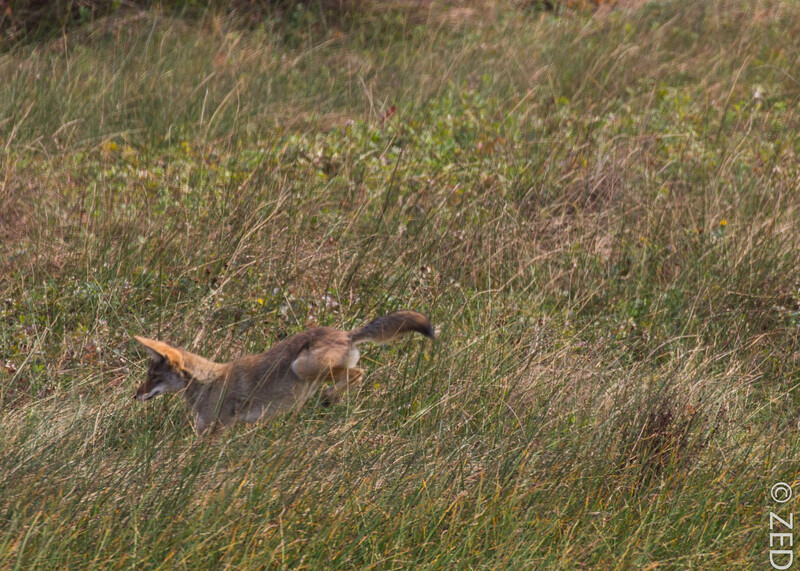 So fun to watch this guy hunt! We had quite a few nice red fox trails to study today, this is a good example of a classic red fox track (front foot on the bottom). 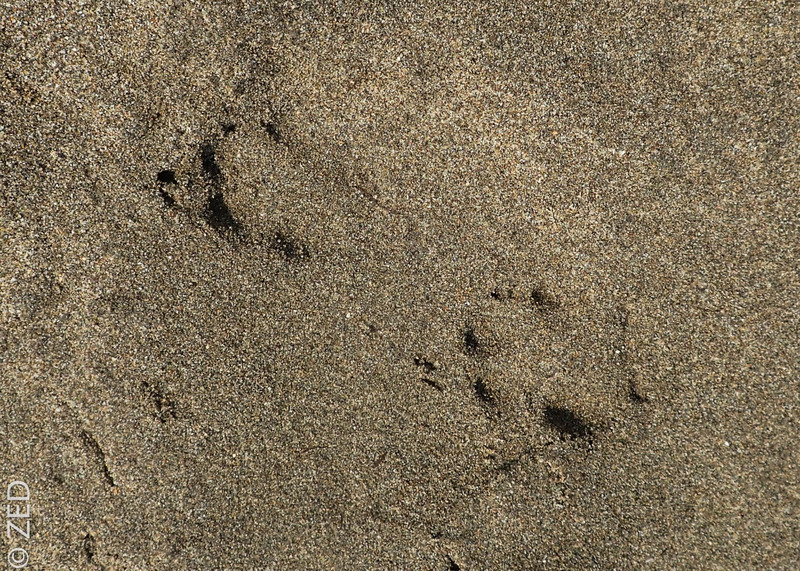 The diagnostic “bar” in the metacarpal pad of the front foot is very evident in this track – it’s not always clear, but if it is it can be one helpful sign (of many) to differentiate red fox tracks from coyote tracks. I didn’t get a picture, but we observed what we believed to be two or three pomarine jaegers (a type of flying sea bird) offshore attacking some elegant terns out at an area where many birds were feeding. It was my first sighting of this species, and evidently it’s uncommon to see them from shore (usually they are seen from boats further out to sea). There were quite a few dead murres along the beach, these are also ocean-going birds, but curiously they come onshore almost exclusively to die. Often people see these birds on the beach and try to save them, not realizing that they are already doomed. Many a kind-hearted person has been confused and heart-broken trying to help these birds. I photographed one last year down towards Moss Landing near Monterey. They look a bit like penguins when they are sitting or moving out of the water. 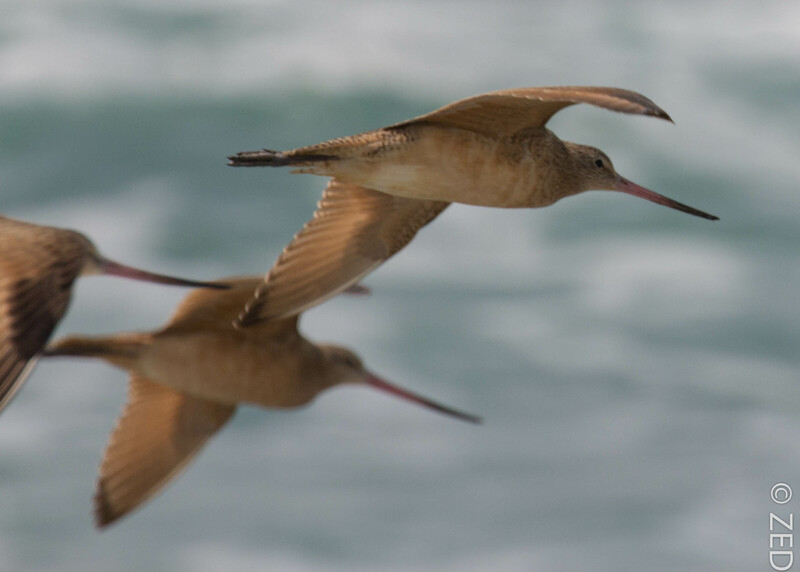 Down on the beach there was a large flock of marbled godwits feeding in the surf line, using their long beaks to probe in the sand for crustaceans – occasionally they would flush and fly down the beach all together. Great day out on the coast, very thankful to live close by to such natural beauty. This entry was posted on September 14, 2015 by feralzach. It was filed under Uncategorized and was tagged with bodega bay, Buteo jamaicensis, california, Canis latrans, common murre, coyote, elegant tern, Limosa fedoa, marbled godwit, osprey, Pandion haliaetus, pomarine jaeger, pounce, red fox, red-tailed hawk, sonoma coast, Stercorarius pomarinus, Thalasseus elegans, Uria aalge, Vulpes vulpes. Thanks JS, and thanks for leading us on a great day! Thanks Dave! Just so I’m not a starving artist.